The Esteem® Implant is a revolutionary device that allows people with hearing loss to live in a way they never dreamed possible. It’s the world’s first and only FDA-approved fully implanted hearing device — there’s nothing in your ear but sound. This all the time, effortless hearing solution lets you be spontaneous, connected and fully engaged in life. Esteem is simply awesome. In Your Head. Out of your Mind. With Esteem, nothing goes in your ear canal. There are no external microphones or speakers affixed to the side of your head, either. In fact, your ear is the microphone. Sounds are captured by the outer ear and funneled down the ear canal. This causes the eardrum to vibrate. No other hearing solution has anything quite like the Esteem Sensor. Its ability to convert the natural vibrations of the eardrum to electrical signals and send them to the implanted Sound Processor is truly one of its kind. 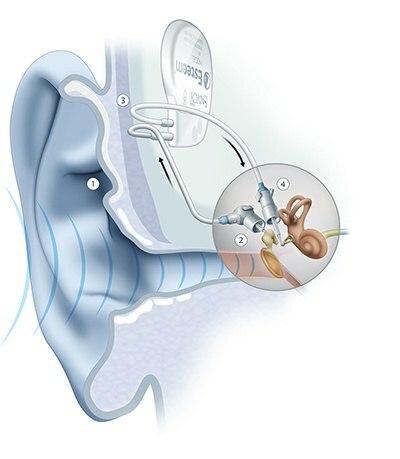 The implanted Esteem Sound Processor is also completely unique to the world of hearing solutions. It receives, adjusts, and intensifies the signals for your hearing loss needs and then passes them along to the Driver. All inside your head. The Esteem Driver translates the signals from the Processor to intensified vibrations. The vibrations are transferred to the inner ear where the tiny cochlea cells, and in turn your brain, are stimulated, causing you to hear more natural sound. The Esteem Programmer allows you to customize your hearing experience. You can turn the device off and on, adjust the volume, and take advantage of three unique program settings. Is your hearing loss affecting the life you live? Does it make you feel like you’re missing out on things? Would you like to throw your hearing aids in the ocean? Have you avoided wearing them entirely? If so, Esteem is likely a solution for you. It is designed to treat adults with the most common type of hearing loss — moderate to severe nerve-related (sensorineural) hearing loss. With Esteem, you can work, play, and live as you could before hearing loss. As an Esteem®-certified practice, we have the special training to counsel you on this remarkable hearing breakthrough—plus the expertise to determine if you would be a good candidate for this innovative long-term hearing solution. 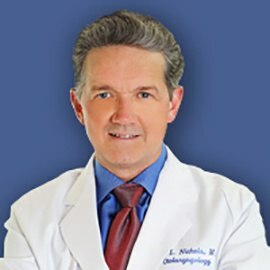 Dr. Mark L. Nichols, a board certifed otolaryngologist, is specifically trained in the Esteem implant surgery. Call 281-649-7000 to schedule an appointment with Dr. Nichols to determine if you are a candidate for this hearing implant. Federal law restricts this device to sale by or on the order of a physician. The practitioners who may implant the Esteem Implant require specific training. For additional information on the indications, contraindications and safety information regarding the Esteem please go to the Important Safety Information link at www.esteemhearing.com/important-safety-information.